I recently purchased myself a ‘do everything’ laptop, it gets almost everything right… it has nearly every type of physical input known to man, switchable graphics and is priced very competitively. I’ll be throwing a 3rd party SSD into it shortly to really top it off, and possibly a higher-end compatible Wacom pen. Unique laser etchings give it a look of class. Finally, a convertible tablet with a proper GPU under the chassis! This has been a big issue in the past as many other convertibles offered only included a built-in Intel GMA chips that couldn’t handle most 3D. This machine runs Starcraft II smoothly! Even under extreme usage, underside does not warm up very much due to thermal design. Matching external CD/DVD/BR drive, this is a definite personal opinion but I rather not have a built-in disk drive. Solid display hinge is able to rotate in both directions. A plethora of input options: keyboard, multi-touch trackpad, accurate pressure sensitive Wacom based pen input and multi-touch screen. You can also attach your own external mouse and/or keyboard via USB or Bluetooth. The touch screen and pen inputs did not require any calibration and worked right out of the box. Battery life provides at least 5 hours of use, but it’s not hard to find an outlet these days. Very comfortable and quiet keyboard. 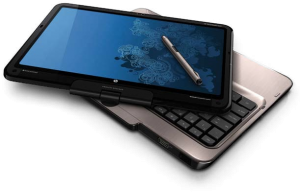 The price is right, much cheaper than similarly spec’ed convertible tablets from Lenovo, Toshiba, etc. The #1 issue with the HP TM2 is the very narrow vertical viewing angle. Even looking at it head-on reveals a slight inversion of color and brightness at the top and bottom of the screen. This causes headaches when trying to show any content on the laptop to others, as well as using the device in tablet form. It also doubles as a mirror when the display is off or set to low brightness. In dark rooms the stand-by LED acts as an aircraft beacon and the dedicated HDD activity LED on the side of device creates a personal rave. Please tone down the brightness or give us a way to disable them. Suffers from Overpowered Blinking LEDs syndrome. Included Digitizer Pen feels like cheap plastic and the secondary button is hard to align to finger by feel alone. How did HP manage to get Dolby approval on this device? this is one tinny sounding laptop, practically on par with the speaker inside a mobile phone. Granted, its easily fixed by plugging into a nice set of headphones or external speakers. I’m curious to find out if HDMI output allows 5.1 surround output. Due to the location of the battery, the laptop is extremely back heavy, thus you might find the laptop falling over or tilting precariously in some situations. This is a non-issue when in tablet mode. There are two buttons to toggle wireless on the laptop. It is easy to accidentally press the on-keyboard button while doing something important, having just one would be ideal. Fingerprint sensor is in an odd location, especially in tablet mode it’s easy to could be a lot better. Attempting to switch between graphics modes manually doesn’t seem to function in some cases. You know those stickers repping the awesome internals of the device (Intel Core i5, Windows 7, ATI, etc)? Every single one was stuck on top of the etchings instead of the opposite side where there are no etchings… on a general note, why can’t all these stickers just go on the underside of the laptop where they don’t ruin the aesthetics of the device? Laptops are not fitted baseball caps, if someone cares enough about the specifications they can just ask. Give us a wider viewing angle, higher resolution, matte screen, perhaps it’s a Wacom conspiracy to keep 3rd parties from cutting into their own Cintiq market, who knows. Add a spot to wrap the pen tether when not in use, I can see it being caught on random stuff in a bag when taking the laptop out. I’ve decided not to use the wire for now. Bring on the Beats Audio, on-board speakers have massive room for improvement. Add a light sensor to automatically adjust the screen brightness, maybe I’ve been pampered by my Nokia E71 cellphone. Add built-in legs to keep tablet mode at a proper writing angle when on a flat surface, I’ll be milling my own. Still too much software cruft for my liking (~25 HP branded pieces of software installed), but it has improved from past offerings.